Adam Tugwell: Has the time come for the transport industry to receive a dispensation on fuel duty like agriculture? Adam Tugwell, a Councillor in Tewkesbury, suggests that in light of more fuel protests the government should do more support the heavily taxed transportation industry. Before beginning, I must declare an interest. With my political head ‘off’ just for a moment, I confess that I own and manage a distribution business and that I too am feeling the hit from the recent rises in fuel duty and oil prices. However, my weekly fuel bill is relatively modest in comparison to companies who run even 1 or 2 heavy goods vehicles and is completely eclipsed when you get into the realms of operators such as Stobart, Excel, Wincanton or BOC to name but a few. Now it is easy to write off the concerns of hauliers if you take the line that the recent fuel hikes have hit all vehicle users, whether you are a 16 year old riding your first moped, or a seasoned executive driving that hate thing of the green lobby – yes, the 4x4. Agreed, we are all feeling the pain and it definitely hurts. So what’s different about the transport industry and why might they have any kind of special treatment? Without consideration of fuel, running large goods vehicles is already an expensive place to be. European Legislation has not helped this and if you were exploring your way into running just one lorry for the purposes of making profit, you would need to have an Operators License, which carries a flat fee, plus a regular charge for every vehicle, a named employee who holds a CPC (Certificate of Professional Competence – In Road Haulage Operations) and an operating centre, which must adhere to Planning and all the other considerations you can imagine. Your staff must have the appropriate vocational driving licences, which for articulated vehicles now have to be obtained in two parts and this is all before you consider the vehicle itself. 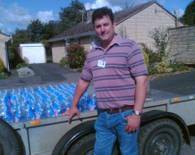 Adam Tugwell, a Conservative Councillor in Tewkesbury, describes how local Conservatives got stuck in and helped deliver water to flooded residents. Friday 20th July in Tewkesbury started pretty normally, other than the fairly consistent and heavy rain which was hammering away outside my office window. By 5pm, lying water in the nearby fields was foretelling a new story for Gloucestershire which didn’t really hit home until I left work. Facing a growing traffic jam into the Town, I decided to use the lanes. Fortunately for me, I was driving my 4x4 pick up and when I found myself in near 18 inches of water, I was promptly able to retrace my steps and enjoy the hour long queue to get home on what is normally a three minute journey. The real scale of what had happened during a day of incessant rain didn’t become clear until I left to assist my staff with newspaper distribution at 6.30 the following day; Tewkesbury was cut off by as much as a 6ft moat in some places and the devastation that I witnessed around the whole area was akin to a scene from the recent Tom Cruise remake of War of The Worlds – the only aliens in this picture being the many people who had been travelling the M5 and had been stranded in the area overnight. Adam Tugwell, a Councillor in Tewkesbury, argues that we need to do more to show we are on the side of those in the poverty trap. So, stage 2 of New Labour Government is in progress and ‘David Cameron’s Conservatives’ are expected to have the best chance of regaining a working majority since the 1997 Election. But what are the real differences between a re-worked socialist Labour Party and the new, improved, greener and leaner Tory Party? Iain Duncan-Smith has just delivered a raft of social policy ideas that have made many people see a very different side to today’s Conservative Party, even if there are serious questions regarding the practicality and depth of the ideas which are on offer. Social policy or the more recent buzzwords ‘social justice’ have never been one of the strongest areas of Tory Policy in the perception of the man in the street. This of course is far from an accurate portrayal, but I nonetheless often ask myself why Labour has so successfully walked away with the prize given to the group of politicians who most effectively sell themselves as caring most about the disadvantaged and the people who experience a rum deal in their everyday lives. So is socialism a real deal or just a great big con? Adam Tugwell, a newly elected Councillor in Tewkesbury, says ConservativeHome readers and commenters need to rally as a positive force. Deep down, a part of me hopes that the recent decision by David Cameron to start a debate with the grassroots has come about at least in part, because of the discussions which take place on this website. As a fairly new participant, I have happily found myself blogging away at peculiar times of the day and night and really appreciate the diversity and passion of the views which often appear in response to a thread. During our election campaign in Tewkesbury this year, we really concentrated on engaging with our electorate instead of relying upon a barrage of unsupported literature to do the job for us. Feedback was good and post-election letters in the local media highlighted the way that voters felt we had been genuinely interested in what is real for them, rather than just assuming that we know best on their behalf. Of course, there will always be a difference between local and national elections, but the fundamentals are basically just the same. We should also be very minded of the fact that many voters do not distinguish between the Conservatives running the local Borough and those patiently waiting for Government in Westminster. Adam Tugwell, a newly elected Councillor in Tewkesbury, wonders why no-one has noticed the significance of the repeal of Section 75 of the Local Government & Provisions Act. Hopefully none of us will by now underestimate the ability of this Government to change things ‘under the radar’, whilst the media concentrates on issues which sell. On the face of it, transport stories seldom tap the imagination, unless there has been a fatal crash, charges for commuters are going up or some other kind of negative splash has been generated by a public brick or two being dropped into the seemingly still pool of all things which move. Earlier this year, a story worthy of note did apparently slip past our ever watchful media when the Government repealed Section 75 of the Local Government & Provisions Act (1975). Admittedly, it doesn’t sound very exciting until you understand that it involves the provision of schools transport, and particularly, the carriage of children with Special Educational Needs.